Welcome to FenScapes, Inc. Where quality counts. 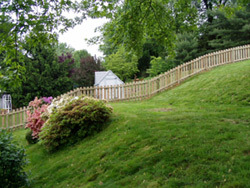 FenScapes, Inc. is dedicated to offering our customers quality products and services at reasonable prices. We stand behind our work. We value the relationships we build with our clients and we guarantee customer satisfaction. Call us for a free estimate on your next project. Our Vinyl Fences - 6 Beautiful Colors, Lifetime Guarantee, Maintenance Free, Woodgrain Texture, Reinforced rails, wonderful racking ability, same design flexibility as wood. If you would like a free estimate, or just have a few questions, feel free to contact us by phone or via email. All images contained within this website are the sole, exclusive and permanent property of FenScapes, its clients past and current or other individuals, companies or organizations. None of these images may be reproduced by any method including screen grabs and downloads without the prior permission of the copyright owner. © 2005 Fenscapes - All rights reserved.